Let's see whether you remember any of this from Sunday or Hebrew school: Different New Testament writers disagree on when Jesus died and how he went to his death, whether with serene self-control or in fear. Some of those writers forged the names of famous Christian apostles on their works. The account of the Israelites conquering the promised land in the Hebrew Bible is almost certainly fanciful, not historical. Those statements are all matters of scholarly consensus. You learn such things if you go to seminary or divinity school, says Bart Ehrman, but pastors usually don't pass them on in sermons or religious-education classes - and as a churchgoer, I can attest that that's true. 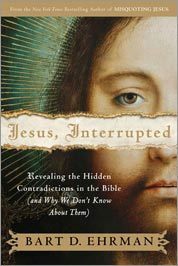 So Erhman, a University of North Carolina religion professor, has published "Jesus, Interrupted," a rundown of what scholars have believed and taught about the Bible, in some cases for a century or more, using the "historical-critical" approach to scripture rather than a purely pious one. The subtitle is misleading. The Bible's contradictions, not to mention its outright errors and myths, are often in full view, not hidden. A cottage industry of books has emerged in recent years to lay them out for popular audiences. Ehrman's earlier effort, "Misquoting Jesus," about the errors and deliberate changes scribes made over the centuries to biblical texts, was a New York Times bestseller, and "Jesus, Interrupted" recently made it onto the list as well. Ehrman admits in this new book that none of what he says is new, and those literate in biblical scholarship will likely find much of his information ho-hum. Yet judging from the e-mail I received as the Globe's former religion columnist, I expect that for more than a few folks, "Jesus, Interrupted" will be a grenade tossed into their tidy living rooms of religious faith. Ehrman concentrates most of his attention on the New Testament because it is his specialty. A fundamentalist Christian as a young man, he lost belief in the Bible as God's inspired word while studying for his doctorate; later, he lost faith altogether and became agnostic because of the widespread presence of suffering in the world. But he repeatedly stresses that historical-critical study need not kill faith. And, honest scholar that he is, he admits that some of his contentions can be challenged. To cite one, he buys a longstanding dig against St. Paul, which goes like this: After his conversion experience, in which he saw the risen Lord, Paul discarded Jesus's insistence on adherence to Jewish law, utterly transforming "the religion of Jesus [into] the religion about Jesus" and his resurrection. You'd think that each of Paul's letters contained just eight words: Jesus died. He rose. That's all she wrote. Yes, Paul believed the resurrection to be the game-changing essential of faith. (You would, too, if you thought you'd just seen a risen dead man.) But as Ehrman knows, Paul has a lot to say about other topics, such as love and forgiveness. And on most of them, his message parallels Jesus's. That some of his colleagues dispute Erhman on certain points is clear. That they all embrace the historical-critical study of the Bible is true as well. So do mainline churches: My Roman Catholic study Bible cites modern scholarship in its analysis of the various books of the Good Book. Indeed, Ehrman writes, some of his best friends in the scholarly world are Christians. Rich Barlow can be reached at barlow81@gmail.com.